In the year 2015 Ionic completed one decade of service to provide innovative water and waste water treatment solutions to industries. 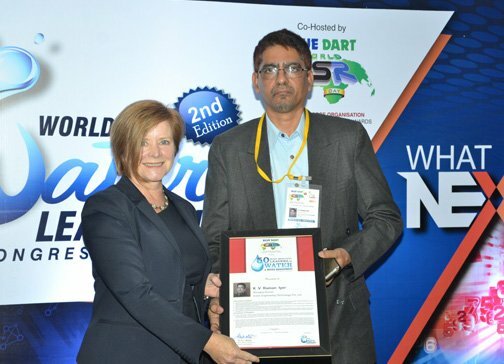 Founder director K.V.Raman was selected as one of the 50 most impactful leaders in water and waste water treatment by World CSR Water Congress in recognition of his contribution to water and waste water treatment. The 50 Most Impactful Leaders in Water & Water Management is intensely researched. This cell constitutes of professionals from different parts of the world and has been tracking good work for over a period of time. It is the iconic job of the research cell to produce a shortlist of Individuals who are doing extraordinary work and track the record of their achievements. The shortlist is then reviewed by a Jury comprising of senior professionals from across the globe. The 50 Most Impactful Leaders in Water & Water Management is a tribute to those who are missionaries and passionate about Water Management. Those Leaders who have believed that Water Management must contribute to Social change are recognized. The World CSR Day pays a Tribute to such Leaders who are Transformational Agents. The 50 Most Impactful Leaders in Water & Water Management (Global Listing) is intensely researched process undertaken by the research cell which consists of Post Graduates in History & Management with over 5 years research experience posts their studies. It is the iconic job of the research cell to produce a shortlist of Individuals who are doing extraordinary work and track the record of their achievements. The shortlist is then reviewed by a Jury comprising of senior professionals from across the globe. Improvement of Water Efficiency & Conservation. Demonstrated Leadership within the sector which has had a positive impact in the advancement of Water Management. Contribution Towards Water-related Groups, Associations & Institutions. Demonstration of Good Leadership & Governance. Contribution to Water Awareness in the Community. Ionic introduces Innovative Cap-Di (capacitive deionization technology) to Indian market. Cap-Di process uses capacitance technology to desalinate the water economically with the help of electricity. In 2016, the term that seems to define the needs of populations around the world, and that has become a mission in its own right, is water reuse. From residential to commercial and industrial consumers, water reuse is becoming more and more essential to our daily survival. The earth’s population is expected to climb fully 35%, that’s 2.5 billion more people, by 2050, meaning that pressure on global water resources is increasing at an even faster rate than ever before. The need for technologies that cost-effectively enable water reuse is currently at its peak of importance. IONIC offers a new technology CapDI (Capacitive Deionization) that removes TDS (total dissolved solids) more cheaply and efficiently than any other technology, and does so at high temperatures. The introduction of this technology means water treatment and reuse can become an affordable and viable option today. Over the last 15 years, innovations in many fields have so rapidly developed that keeping up with the ever-changing technologies has not only been difficult, but also very expensive. In the water reuse field, there have been numerous technologies that have been developed in order to help solve the water issues we have at hand; the same issues that we have been dealing with for many years now. These technologies are particularly important for industries that consume significant amounts of water during normal operation such as boiler feed, cooling tower make, paint shops, electro plating, manufacturing processes, commercial laundries, textile processing and the list is endless. Water reduction and reuse not only helps save the planet by consumers and businesses becoming more environmentally friendly, but it also saves costs in both personal and industrial applications. Capacitive Deionization technology, CapDI©, deionizes brackish water at the lowest economic and environmental cost of any globally available technology. CapDI© is a simple, innovative, and most importantly cost-effective way to remove TDS from water. Current technologies, such as reverse osmosis (RO) wastes water and operating cost is high due to high energy consumption, water wastage, chemical consumption, maintenance cost etc. Cap Di technogy from IONIC offers exceptional operational, chemical, and energy costs savings. This technology recovers up to 90% of the water it treats, and does so at low energy cost. CapDI© is a simple 2-step process wherein water flows between electrodes, where the electrode surfaces are separated from the water by membranes that selectively allow positive or negative ions to pass. In the first step, purification, saline water passes between oppositely charged electrodes which electrostatically remove dissolved ions, leaving pure water flowing out of the cell. In the second step, regeneration, feed water flushes through the cell at a lower flow rate, while electrode polarity is reversed. Ions are then rejected from the electrode surface, concentrated in the flow channel, and flushed from the cell before the cycle is repeated. 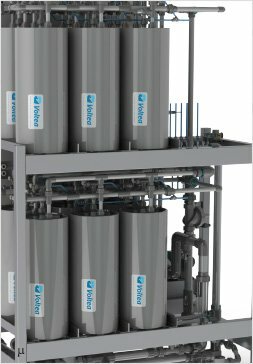 Moreover, a critically important feature of the technology is that the amount of TDS removed from the water is tunable and the process is dynamically controlled automatically based on feed water characteristics and hence the system can easily handle variations in feed water characteristics. CapDI© is special in more ways than one, starting with and most importantly that it removes TDS at ambient as well as high temperatures up to 60 deg C.(with high temperature modules). No other technology, globally, has the ability to do so. CapDI© is also environmentally friendly in that there are no chemicals used for treatment, which ensures that any unrecovered water flows back into the ecosystem safely. Unlike RO systems that can waste more than 60% of treated water, CapDI© can recover up to 90% of the water it treats, resulting in long-term water conservation. Also unlike RO systems, CapDI© is tunable, meaning that the extent of which salts and other ions are removed can be customized to the consumer’s needs, depending on the application. It is important in certain applications that not all of the dissolved salts and other minerals are fully removed because their presence in low concentrations is necessary for certain types of usage. This is where the tunable removal feature of CapDI© differentiates itself. Cap DI technology treats water types ranging from residential consumer appliances to large-scale industrial plants. Our systems are modular, allowing easy expansion to meet any increased water demands. CapDI is tunable, allowing adjustable TDS reduction between 25 – 95% depending on customer needs, eliminating the requirement for blending to achieve a specific water quality. The customer sets their desired reduction rate and CapDI maintains this level, continually adjusting itself to account for any fluctuations in feed water characteristics. WHAT ELSE CAN CapDI© DO? In recent years, regulations have become stricter regarding the quality of effluent discharged from wastewater treatment plants into rivers or the sea. This regulatory environment makes wastewater reuse for agricultural purposes an attractive option for farmers, wastewater treatment plant operators, and companies providing wastewater reuse solutions. In manufacturing processes Cap Di can work as a standalone unit to desalinate the water and make it suitable for drinking, boiler feed, cooling tower make, rinse water in paint shops, water jet cutting machines, machine coolant make up, and be part of the RO pretreatment and post treatment, be part of demineralization system pretreatment so that the size of the system can be reduced, chemical consumption and waste water disposal problem can be reduced. In industrial applications, cooling towers use large quantities of water and chemicals. A cooling tower carries away heat through the evaporation of water. This water contains natural salts such as calcium, bicarbonate, chloride, and sulfate. The salts do not evaporate and build up over time, thus causing corrosion and scaling. To prevent this, chemicals are added to the cooling water. Eventually this water is discharged, and the cooling tower is refilled with clean water. In cooling towers, the CapDI© system treats water before it enters the cooling tower, reducing salts from the incoming water stream by 80%. The cooling tower does not need to be adapted since CapDI© is placed before the cooling tower, treating only the incoming water, because the composition of the recirculating water remains unchanged. This allows the water to remain in the cooling tower up to five times longer, resulting in lower overall water consumption and wastewater production. Fewer scale and corrosion inhibitors are required to treat the water because of the decreased water consumption. For cooling systems that face existing problems with corrosion and scaling, CapDI© can also be used to reduce the scaling and corrosion potential of cooling tower water. Once installed, CapDI© is essentially risk-free since it does not change the chemical treatment program, the conductivity levels, or the settings of the cooling tower. The easy-to-implement CapDI© systems improve cooling tower efficiency by reducing water and chemical usage for both industrial and institutional systems. Installing CapDI© in the cooling tower make-up enables make-up water savings of up to 40%, blow-down water savings of up to 60%, scaling and corrosion inhibitor chemical savings of 50%, plus overall improved performance. Lower water usage and lower chemical discharge make CapDI© an exceptional environmentally friendly water reuse leader for industrial facilities that rely on cooling towers. The amount of water that cooling towers use annually, about 30,000 m3 for a small cooling tower, is enough to supply over 200 households with water for an entire year. CapDI©, would make a monumental difference in water usage around the world, and set an incredible precedent of how to jump-start other efforts towards solving global water challenges. For further information contact us with complete raw water analysis and your specific requirement. Ionic can provide pilot plant for trials at customer’s facility to evaluate the performance. IONIC is pleased to introduce the next generation water treatment system using “Electrox” electro chemical advanced oxidation technology to remove dissolved organics (COD,TOC) from water and get the right quality of water. Till recently activated carbon, Reverse osmosis, ion exchange, chemical oxidation, photo chemical oxidation etc. were the only options available or considered for reduction of organics (TOC) in the water inspite of its limitations and disadvantages. 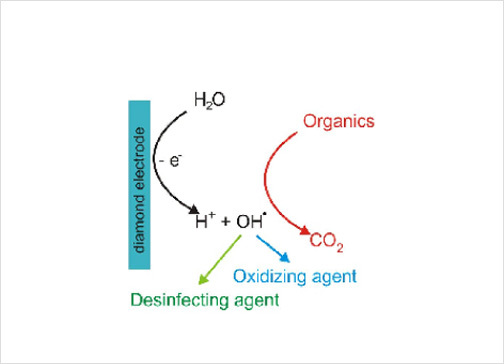 Electrooxidation is an electrochemical advanced oxidation process in which oxidation reactions occur by applying an electric field between the anode and cathode, it is designed to offer complete oxidation of all organic compounds (including persistent and toxic components) and ammonium in water. In this process the cathode and anode is coated with conducting chemically inert material. These materials have catalytic properties which allow the oxidation of the pollutants, either by direct contact with the anode, or by oxidation in the media. Specific toxins: CN, pesticides, herbicides, PCBs, phenols, fungicides. Water is passed through a series of special electrodes placed in a compact cell. A low voltage is applied between the electrodes. The oppositely charged ions get attracted to the electrodes. Clean, treated water flows out of the system. Periodically the polarity of the electrodes are reversed to prevent scaling on the electrodes. The attracted ions drops from the electrodes. Very powerful oxidising agent Hydroxyl radicals are generated on the surface of the anodes which reacts with organics and oxidises them completely and coverts to carbon Dioxide. The entire process is handled automatically. Depending on the nature and quantum of the organics in water the applied current and contact time is set to get the desired results. Can be Remotely operated, monitored with your desktop/laptop/smart phone ! Ionic has been manufacturing Chlorine Dioxide generators for onsite generation of Chloride dioxide for various water and waste water treatment uses. 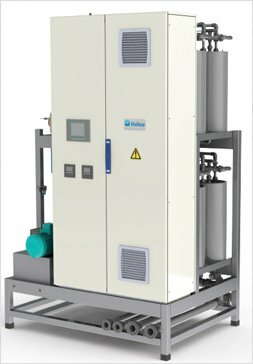 In addition to standard above ground reactor design now Ionic introduces unique GENOX-SUW underwater submerged chlorine dioxide generators with under water reactors in which Chlorine Dioxide is safely generated making the whole process 100% safe. It means the formation of chlorine dioxide takes place only in the water and it is not present in any other part of the plant. We can say it is 100% safe generator because there is no possibility for Chlorine Dioxide to be released to the atmosphere. In normal chlorine dioxide generators you will find in the market the chlorine dioxide is a reaction chamber having a big volume – a 10 Kg reactor will need 70 Litres of volume. 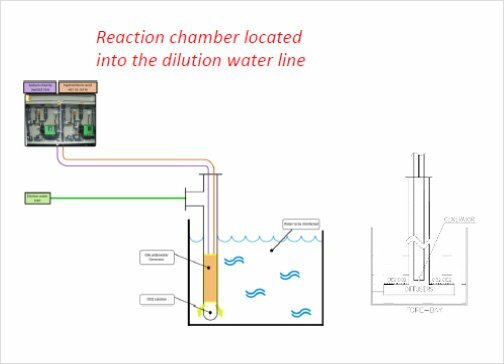 The reactor is not submerged and hence the leakage of concentrated chlorine dioxide solution is a strong possibility and hence associated explosion hazard. 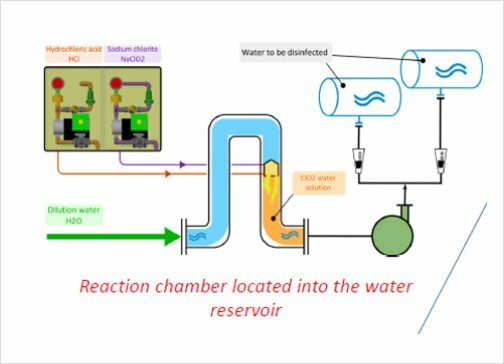 This configuration is the safest solution for the chlorine dioxide generation, because the two precursor concentrated chemicals and dilution water are accrued in a double containment piping from the dosing location up to the injection point in the submerged reactor. Since the generator is always submerged in water chlorine dioxide will be disperses in water only. The generator is protected by a suitable cover and diffusion system so that generated chlorine dioxide solution is properly diluted and mixed with surrounding water to safe concentration and to make it efficient. Planning for a project ? Get in touch with us.. We love to serve you..